Hard to believe that another week has passed and it's time for another edition of Ready For The Weekend. This week we are first off to Portsmouth on Friday night before heading to Bristol on Saturday. The weekend will finish off on Sunday (as is traditional for a weekend) in London. So let's get Ready For The Weekend. We start off the wrestling weekend with a trip down to Portsmouth for Revolution ProWrestling's event at the Portsmouth Guildhall. The show will see New Japan's Jay White back in action at RevPro after a successful out at Uprising 2016 against Josh Bodom. This time he'll be facing world-class opposition in “The Star Attraction” Mark Haskins. White is currently on tour to gain more experience and he's guaranteed to get that against Haskins who is currently on possibly the best run of his career so far. While White has only recently come to RevPro and will hopefully continue to do so, this Friday will be the last time that “The Beast Of Belfast” Big Damo steps between the ropes of RevPro. With that being the case, RevPro management have granted Damo the right to choose his last opponent. The Northern Irish heavyweight has decided to face a man who he has had close ties with, Psycho Phillips. Damo has been a mentor to Phillips and this will be the bout for Phillips to show Damo what he's learned during their time as allies. However, Damo will be out to prove that while he's taught Phillips a lot of what he knows, he's not taught him everything that he knows and shall look to leave RevPro with one last win. The main event for this Friday came about at the conclusion of Uprising 2016. Pete Dunne was a direct cause of Will Ospreay losing to Vader in the sold out York Hall. After the match, an angry Ospreay informed Dunne that if he wanted his rematch for the Undisputed British Cruiserweight Championship then he was more than willing to give him it. Well why wait any longer than we have to? This Friday night, Dunne gets his chance at Ospreay and the Undisputed British Cruiserweight Championship in Portsmouth. Dunne ruled the Cruiserweight division until his loss to Ospreay, whilst Ospreay wants revenge for Pete Dunne costing him his match against The Mastodon. Let's have a fight this Friday night! 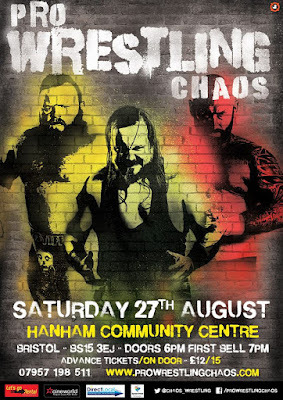 Moving on to Saturday and Pro Wrestling Chaos will be at the Hanham Community Centre in Bristol with Choose Your Weapon. 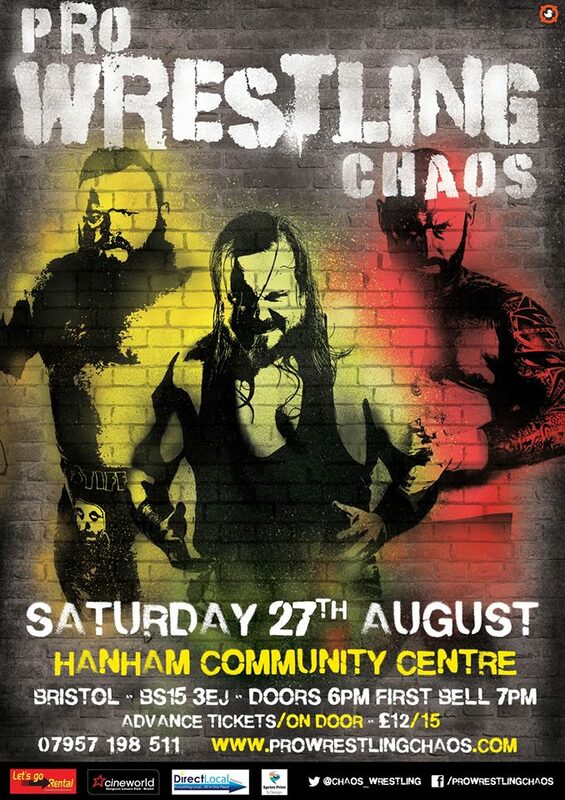 The event shall see the debut of one of the top heavyweights in Europe in the shape of Dave Mastiff. He will look to make an immediate impact as he challenges Wild Boar for the King Of Chaos Championship. Boar has been a fighting champion and will welcome the challenge that Mastiff will bring. Two of the hardest hitting men in British Wrestling will meet and only one of them will be a champion at the end of it. Gideon has been after the Doomsday Killers and more specifically their leader Ian Williams for what seems an eternity. Williams has always found a way to escape or just avoid being in the ring with Gideon. Gideon has had to resort to the ultimate risk in order to just get a match with Williams. He has agreed to put his career on the line in a No Disqualification match this Saturday against Williams. The leader of Doomsday Killers is as cunning as he is devious and has in a way gotten Gideon right where he wants him. However, Gideon now cannot be stopped by any rules and with the anger and fury inside him for Williams, I doubt that anyone would dare get involved during the contest. If anyone does, they may suffer the same fate as what may await Williams. Either that or we've seen the last of Gideon in PWC. The war for control of PWC began a few months ago with the return of Dave Mercy. Since then, General Manager Jimmy Havoc, have announced that there will be an 8-man tag team match at All Or Nothing on 29th October with the winning team gaining full power for their respective leader. However before that match takes place, there will be a match this Saturday where Pariah Khan's Jeckel and a partner of his choosing will face Mercy's Mike Bird and his partner in tag team action. This is the first battle in this war of control. A win for either team will be a great boost ahead of 29th October and could also help the winning team to recruit more members. The battle lines have been drawn and now the fight is on and there can only be one eventual winner. Jeckel & ??? vs Mike Bird & ??? Finally we end the weekend back at PROGRESS Wrestling with Chapter 35: Writing Nirvana On Other People's Bags at the sold out (Editor's Note: Return tickets still available) Electric Ballroom in Camden, London. After this Sunday we'll know what the final of the Atlas Championship tournament will be with both semi-final matches taking place. The first semi-final will see “Iron Man” Joe Coffey face The Origin's Dave Mastiff while the second semi-final shall feature Rampage Brown and T-Bone. Any combination of these four men would be a worthy final to crown the inaugural Atlas Champion. This championship was designed for true heavyweights and that is exactly what we shall have with these two semi-final matches. Heavyweight encounters are coming this Sunday. With the next Natural Progression Series being used to determine the first PROGRESS Women's Champion, the women's division in PROGRESS will be growing in the coming months. That starts at Chapter 35 when both Alex Windsor and Nixon Newell make their debut when they compete against each other. Both are well known in British Wrestling and have a wealth of experience. These two women have met before in SWE and VII Pro and put on stellar performances. They'll look to deliver another this Sunday and put themselves in serious contention for inclusion in the next Natural Progression Series. 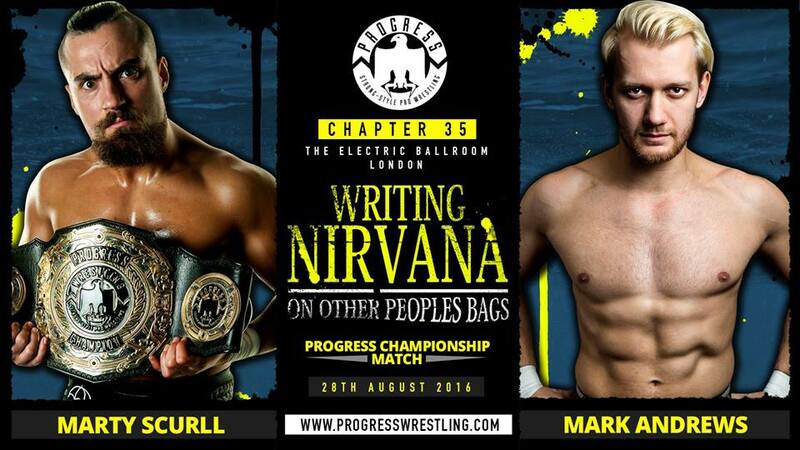 The main event this Sunday will see Marty Scurll defend the PROGRESS World Championship against Mark Andrews. Andrews has been on an impressive run of wins recently and PROGRESS have deemed him worthy of a championship opportunity. While Scurll is the first ever two-time PROGRESS Champion, if Andrews were to win, he would become a two-time champion himself. While Scurll may be looking ahead to the PROGRESS Championship triple threat match in Brixton with Tommy End and Mark Haskins, to look past Andrews as a credible threat could well mean that Scurll doesn't even make it to Chapter 36 as champion.